Greenock Morton moved top of Scottish League One and knocked opponents Stranraer down to third by winning at Stair Park. 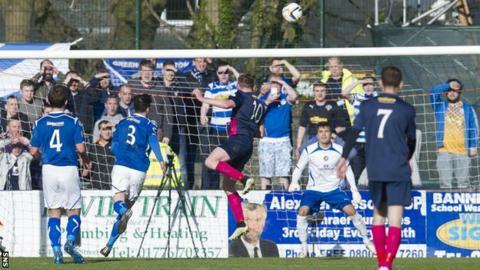 Morton took the lead from the penalty spot after Steven Bell had fouled Peter MacDonald, Declan McManus converting. And McManus headed his second from Ross Forbes' cross before the break. Both sides were reduced to 10 men with Morton's Ricki Lamie dismissed for serious foul play and Stranraer's Chris Aitken sent off for violent conduct. Though Morton are level on points with Forfar Athletic, the Greenock side have a superior goal difference going into next week's final round of fixtures. Morton visit Peterhead, Forfar host Ayr United and Stranraer, who trail by two points, are at Brechin City. Match ends, Stranraer 0, Morton 2. Second Half ends, Stranraer 0, Morton 2. Corner, Morton. Conceded by Steven Bell. Chris Aitken (Stranraer) is shown the red card for fighting. Foul by Chris Aitken (Stranraer). Attempt saved. Scott Rumsby (Stranraer) header from the centre of the box is saved in the top centre of the goal. Corner, Stranraer. Conceded by Joe McKee. Stephen Stirling (Stranraer) wins a free kick in the defensive half. Substitution, Morton. Ross Caldwell replaces Peter MacDonald. Attempt missed. Stefan McCluskey (Morton) right footed shot from the centre of the box is close, but misses to the left. Corner, Morton. Conceded by David Mitchell. Attempt saved. Stefan McCluskey (Morton) right footed shot from outside the box is saved in the bottom right corner. Mark Russell (Morton) wins a free kick in the attacking half. Foul by Frank McKeown (Stranraer). Attempt missed. Ross Forbes (Morton) right footed shot from outside the box is close, but misses to the right. Ricki Lamie (Morton) is shown the red card for a bad foul. Daniel Stoney (Stranraer) wins a free kick on the left wing. William Gibson (Stranraer) is shown the yellow card. Stefan McCluskey (Morton) wins a free kick in the defensive half. Lee Kilday (Morton) is shown the yellow card. Attempt blocked. Stephen Stirling (Stranraer) right footed shot from outside the box is blocked. Joe McKee (Morton) wins a free kick on the left wing. Foul by Daniel Stoney (Stranraer). Ricki Lamie (Morton) wins a free kick in the defensive half. Substitution, Stranraer. Daniel Stoney replaces Craig Malcolm. Attempt missed. Frank McKeown (Stranraer) header from the centre of the box is too high following a corner. Corner, Stranraer. Conceded by Ricki Lamie. Attempt saved. Stephen Stirling (Stranraer) left footed shot from the left side of the box is saved in the centre of the goal.